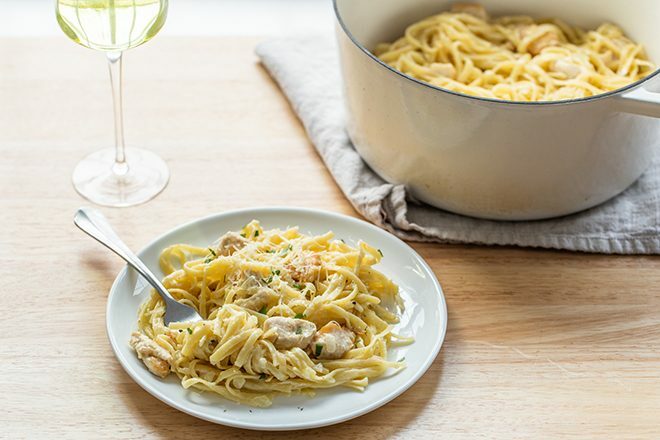 This creamy, garlicky Instant Pot Chicken Alfredo is a no-brainer one pot meal. All of the cooking, including the noodles, is done in the pot making getting dinner on the table and clean up a breeze. 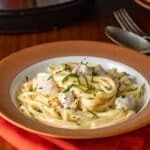 Unlike the authentic Italian fettuccine Alfredo, this version is creamy, garlicky and flecked with nutmeg. 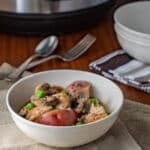 And best of all, it is made in the Instant Pot which means it is on the table in under 45 minutes. Because everything, including the noodles, is cooked in the pot, you can be enjoying family time in no time. 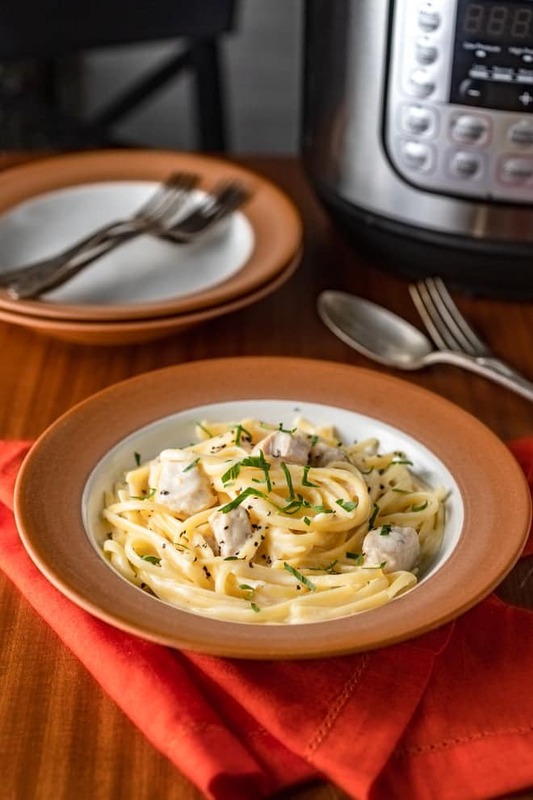 After learning the secret to perfectly cooked pasta in the Instant Pot, I was super excited to use it to make Chicken Alfredo. There are a couple of things to note about the “secret.” First it’s important to “layer” the liquid and the pasta and second, once the pasta goes in, there is no stirring allowed. Holding back some of the chicken stock and pouring it over the noodles, that have been placed on top of the chicken and cream sauce, ensures that the noodles cook evenly and don’t stick together. 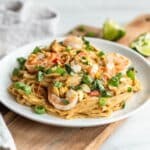 If you stir the mixture after the noodles have been added, you run the risk of pushing the noodles to the bottom of the pan, which can lead to the BURN notice. With the perfectly-cooked-pasta secret under my belt, the next issue was to make sure that the sauce didn’t curdle. The answer to this is heavy cream. (Note of caution: DO NOT substitute Half and Half or whole milk for the heavy cream, your sauce is more likely to curdle.) 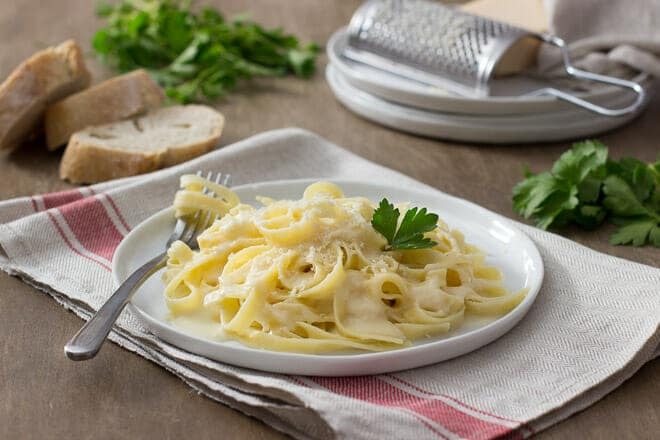 Since this isn’t a dish that I serve frequently, I don’t mind splurging on the cream, especially if it means that the sauce comes out silky, smooth. 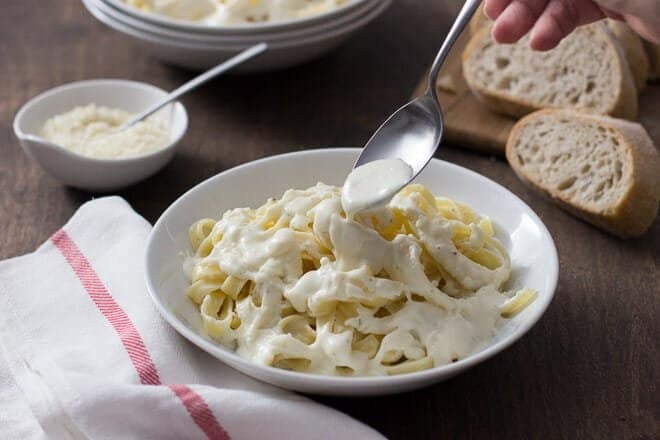 If you want to serve Chicken Alfredo more often, I do have a recipe for a stovetop Alfredo Sauce with less calories using Greek yogurt. One more tip, make sure that you do the full 5 minutes of natural pressure release. This will allow the sauce to settle a bit which will help to avoid a creamy steam bath in the kitchen. Add oil to the inner pot and select SAUTÉ to pre-heat. 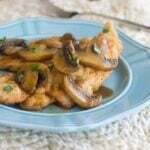 When the indicator says HOT, add the chicken to the pot and cook stirring occasionally, until the chicken starts to brown, about 2 – 3 minutes. Add the butter and the garlic and cook for another 4 minutes. Add 1 cup of the chicken stock and deglaze the pot, scraping the bottom to loosen all of the bits. Press CANCEL and add the cream. Stir to combine well. Do not stir after this point. 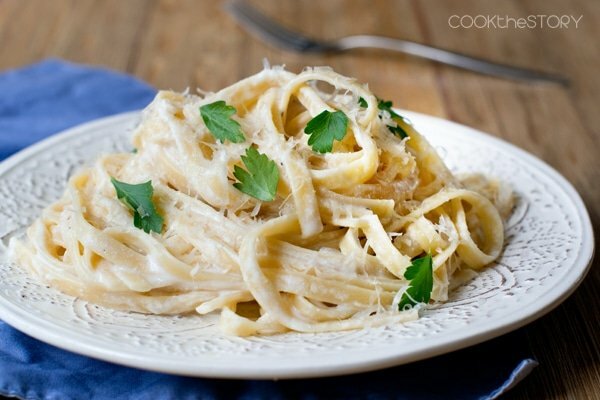 Break the fettuccine in half and place on top of the cream and chicken mixture. Do not stir. Pour the remaining chicken broth over the noodles – remember, no stirring. Select PRESSURE COOK and cook on high. Set 5 minutes of pressure cooking time. When time is up, allow a natural pressure release of 5 minutes and then turn the steam release handle to the venting position and allow remaining steam to escape. When the valve has dropped, unlock the lid and open carefully. Press CANCEL and add the Parmesan, and nutmeg stirring to combine. Replace the lid and allow the residual heat to melt the Parmesan, about 3 minutes.